Latest Mehndi Designs For The 2018 Bride! Bridal mehndi designs today are going through a big makeover. 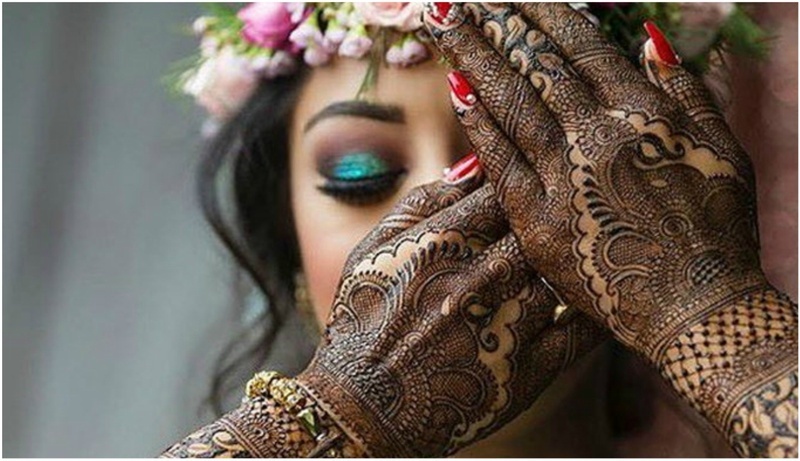 A millenial bride’s mehndi design today consists of awe-inspiring art, which is a trend setter in itself. We have been seeing a lot of mehandi designs which are either over-the-top personalised ones with brides telling their stories through it, or going completely minimalistic with nothing but a mandala pattern in it. These easy mehendi designs completely jazz up your bridal portrait, making them a sight for sore eyes. If you too are on a lookout for something different than the conventional henna designs, then we’ve got you covered! We have compiled a list of the latest mehndi designs - some oh-so-awesome, some modern and some classic for every kind of 2018 bride! Include your dear pet in your henna design. We love how this bride got a picture of her pup as a part of her mehndi design. Her dog bestie is just too cute to handle! Are you a minion fan? Then you are going to go gaga over how this bride got minions in her mehendi design. If you find it hard to express your love for him in just 2 lines, then get the whole love note included in your mehendi design, sister! We are totally eyeing this creative yet simple way of incorporating a heartfelt message in the mehandi design! Here’s one more bride who got her groom's potrait in her bridal mehendi. If you can’t decide which design you wanna go for in your bridal mehandi, then you can also layer them all. We are guessing these brides were spoilt for choices! Image source - Candid Wedding Stories. Including your romantic proposal scene in your mehendi design is pretty cool too - just include the proposal location or any other memorable aspect of it in your mehandi design. Check out the London Eye, Eiffel Tower & the moons & stars night below! Do you believe in the saying ‘less is more’ ? Well, then you don’t have to always go overboard with your mehendi design. The simple yet minimalist henna designs are equally gorgeous too. Image Source - The Wedding Salad. Lattice or jali has been a traditional form of mehendi from the Mughals and the Rajput period. After all this time, they remain a classic and are still a popular choice for all the millennial brides. Image Source - Taaniyah Seth Photograph. The word ‘mandala’ symbolises wholeness. Simple mehendi designs incorporating single mandalas include a single concentric motif on each hand, surrounded by desired mehendi patterns around it. Image source - Plush Affairs. It’s a very popular, yet age old tradition of hiding the groom’s name inside the intricate mehendi pattern. This trend being a little jaded right now, you can also opt for including your wedding hashtag in your mehndi design. Getting mehendi applied on your feet is just too ‘been-there-done-that’. A lot of brides nowadays are opting for mehendi on their sole and they look just stunning! Brides are constantly taking their mehendi game up a notch with the forthcoming wedding season and these delicate and easy mehndi designs on the back are nothing less than gorgeous! With this list of latest mehndi designs coming to an end we’re sure you’ve decided which mehendi design to go for. So go ahead and jazz up your mehendi design with your love story, loved ones or love notes! After all, it’s your big day and your henna design should portray the same!